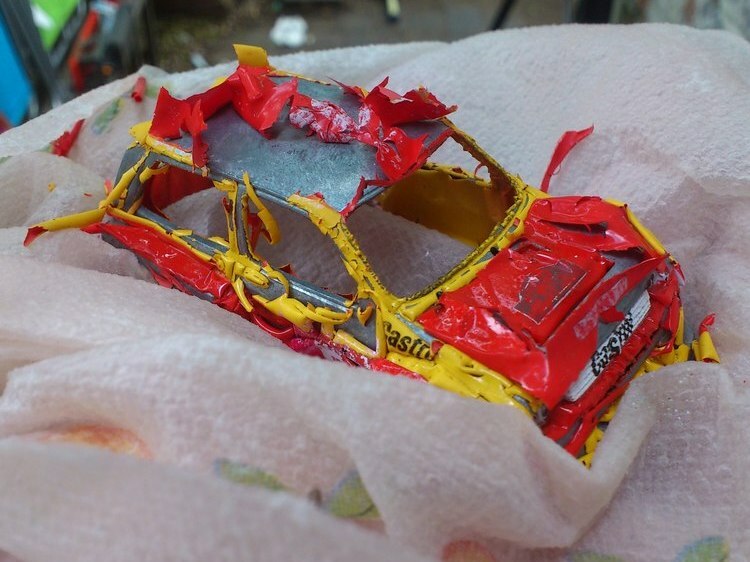 ...at stripping paint from diecast models in an economical manner so that the Cellulose Thinners may be reused! Here's a couple of photos showing 'my system' in operation, followed by Colin's method in detail. Cheers mate, you're an absolute star! Cazzo wrote: All the models were wrapped in paper towel and put into thinners to sit for about half an hour. 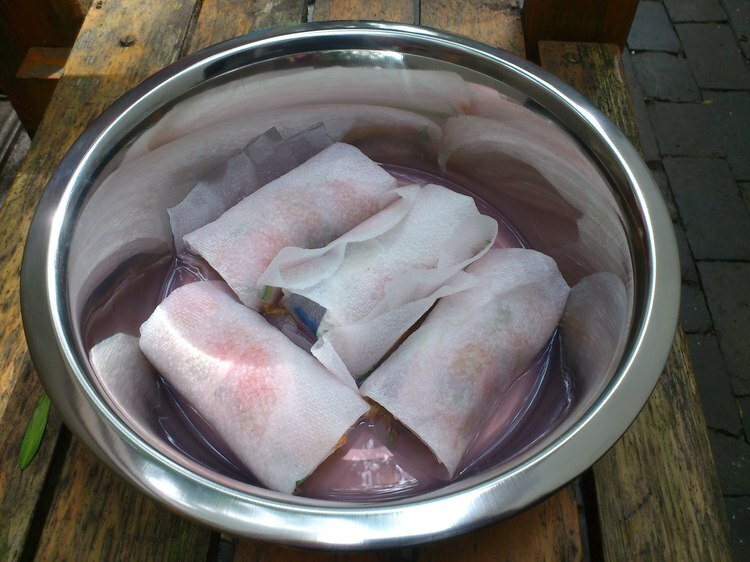 I then took them out 1 at a time and gave them a rub while they were still wrapped up in the towel. Doing it this way means all the paint that comes off stays in the paper and I can reuse the thinners over and over again. When most of the paint is off and the paper towel is removed I just had to give the model a quick rub over with a stiff plastic brush. Honest Colin, it really does work a treat! I suppose does still requires removing the wings and other removable bits? Unfortunately yes Juha, but wrapping each model in some 2-ply blue paper roll, or a heavy duty kitchen roll, at least ensures that the cellulose thinners isn't contaminated with a myriad of paint residue! I must have stripped a dozen this afternoon, and apart from 3 or 4 small flakes of paint, the thinners is still clean - although it does have a slight pinky tinge to it, but only because I squeezed out any excess thinners from each piece of paper once I lifted it out. I thought they were your latest spray jobs there DC, was going to say, getting better mate, keep trying. Reckon I'll be giving this a go next time! Guys, I've only just seen this method and I'm worried! In the first photo, it looks like David had four models in the jar..............yet only two survived! Seriously, it does look a great technique. I've been using the Nitromors with great success - love the pop tht the paint makes as the Nitromors gets underneath it, especially on the roof panels! However, when I've finished my current bottle of the serious stuff, I'll give this technique a try. gaz_bass wrote: I thought they were your latest spray jobs there DC, was going to say, getting better mate, keep trying. Reckon I'll be giving this a go next time! ...as my Department for Work and Pensions 'modelling allowance' hasn't materialised yet, so I'm working to a budget! Hampton Caught wrote: Guys, I've only just seen this method and I'm worried! Like I said Steve, it works perfectly. All you have to do is ensure that all of your model is covered, and that it has had long enough under the thinners. 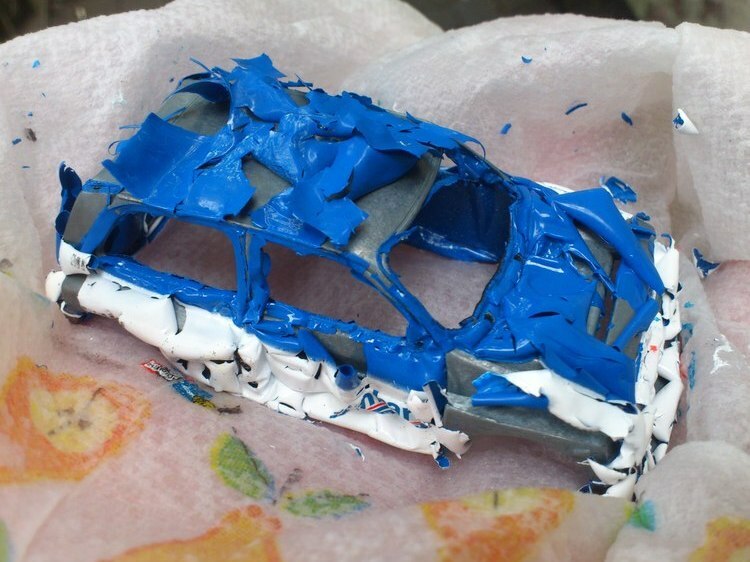 Wrapping each base model in strong kitchen towel, or blue paper roll, ensures that the vast majority of paint is retained within it, and the thinners therefore remains uncontaminated. Mine only started to discolour because I squeezed out any excess thinners from each base model / kitchen towel bundle to use another day. Yes David, certainly looks effective and cheap by recycling the thinners. One more query though: Is the Mini headlamp unit essential or would any kitchen bowl work as well? The Mini headlamp unit is there to get an even more authentic BMC/BL/ARG experience. ...you'll be telling me next that you didn't know I had a stainless steel dog! "Used under license from BMD 2013"
Thanks for clarifying, David. What grade of stainless steel have you used? (For the bowl, I mean, not the dog!) Must get the detail right. I've invested in a roll of 2-ply especially, now I need the rest of the hardware. Billy, whoever would have thought that a 'sensible' and useful 'handy hint' thread could be turned into a series of gags and daft comments? I know, Billy! Surely not! 'Keep 'em short, informative, to the point and on no account use humour in my posts' that's always been my motto! Ahem! As it has been yours too, Billy! Maybe David can get his thread back? Maybe!!!!! ah david's over 50 now, so he'l find it hard catching us young whippersnappers to punish us for the hijack of his thread!! Billy, sorry to mention this, mate, but neither of us are far behind 'the ole' man! doh!!! forgot you can see my age!! !